I thought I had got my form finished until I tested it. 2. Pages 2 -11 - each visitor will be directed to one of these pages (2 - 11) depending on which radio button they select on page 1. Here they will upload information and a file. They must pay for each file they upload. SO the theory was that once they upload their file they would press next and go to the PayPal page and then, once they had paid, they would submit. All that happens when I test the form is that if they select radio buttons 1 - 9 they go to the appropriate page but if they click next they are directed to the next page NOT THE PAYPAL. I tried putting a submit button on page 2 but this just submits the form and does not go to PayPal. The only page with the PayPal option is page 11. 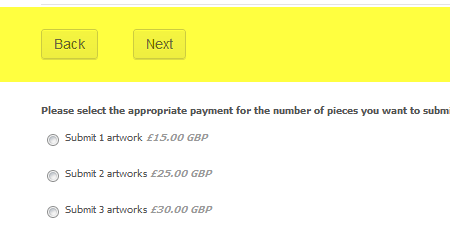 How do I make the form do what I want ie once they have uploaded files from any of the pages 2-11, they are then taken to a payment page and lastly to a submit page? You can try the following workaround. Add one more Page Break element to your form in order to separate the Payment Page. 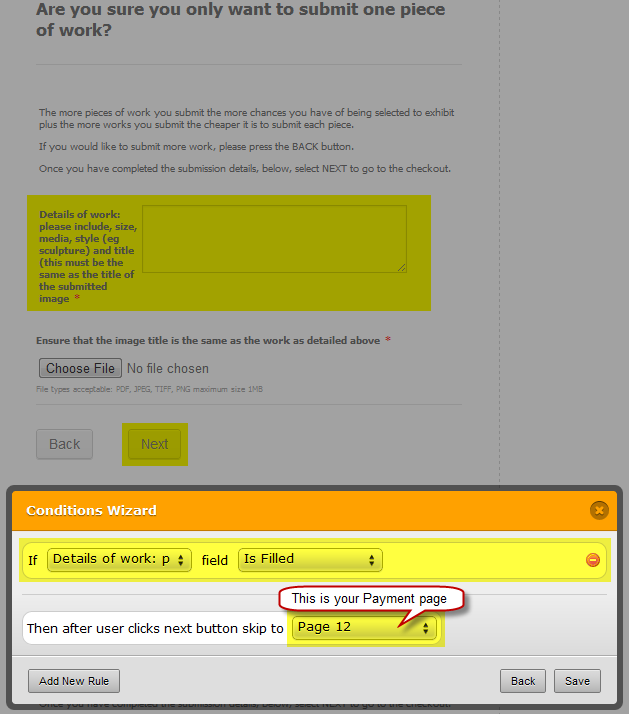 Then, add more Skip to a page or end of the form conditions to forward your users to the Payment Page once they upload their files and click on the Next button. You will need to add these conditions for each upload page except the last one (9 conditions). In this case, your users will be directed to the PayPal once they submit your form. If in any case you get difficulty on working on the process, just let us know so we can assist you.